Tuvalu: 1981 45c Fish Definitive - Great Stamp! 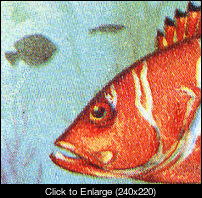 A very attractive definitive set of stamps, featuring fish, was place on sale in Tuvalu on January 24, 1979. The original set consisted of 18 values. A 45c value, for a new postal rate, was later issued on June 16, 1981. This set is one of my all time favourites of modern definitive stamps, and the 45c value is my favourite of the designs. There are many varieties of this stamp! The first one I will cover is the "Bleeding fish variety". This nice variety occurs once per sheet of 38, cylinder position 1A. A very strange sheet format with horizontal and vertical gutters and 2 labels. The master sheets had 1A and 1B side by side and cut apart after printing. That means one out of 76 stamps have this variety. 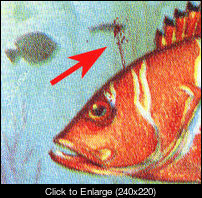 38,000 stamps were printed so only 500 "bleeding fish" stamps exist. Mint are findable. Some the left sides of the panes were torn apart in blocks of 4 with margins and stapled into booklets with other values. Some stamps from cylinder 1B met the same fate. The exist overprinted "Official" too. However, no booklet panes were made as such, so used examples are not as rare as the regular ones.